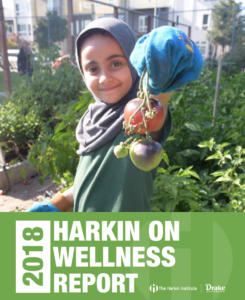 The Harkin Institute for Public Policy & Citizen Engagement on Wednesday released its first Harkin on Wellness Report, which provides detailed information about 11 successful community wellness and nutrition initiatives from around the United States. The report was designed to share best practices for how communities and organizations can invest in health. The 11 designees highlighted in the report were selected from more than 60 submissions, based not only on their individual success but their ability to be replicated by other communities. Wellness and nutrition is one of four areas where The Harkin Institute focuses its research and education efforts, along with labor and employment, retirement security, and people with disabilities. HOW designees were recognized at the institute’s inaugural Harkin on Wellness Symposium on Wednesday, March 22.